A private school for children with autism has reopened its residential care section after inspectors lifted a suspension order. 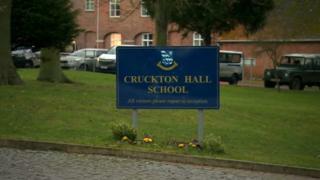 The children's home element at Cruckton Hall School was closed in January after Ofsted and the Department for Education (DfE) raised concerns on safeguarding. At the time, 20 of the school's 33 pupils were residential. It says it has been addressing issues and will be supporting pupils who return to residential care. In November, the DfE ordered the school, near Shrewsbury, to submit an action plan after an Ofsted inspection revealed problems around educational standards, student welfare and leadership. A statement from the school said Ofsted had recognised the progress that had been made and that the school was committed to "continuing to provide a high quality, safe environment for the children and young people we work with". It continued: "Our focus is now on supporting our children and young people to return to the home, as most appropriate for them. "We will continue to work closely with them and their families, as well as local authorities, social workers and Ofsted, to ensure they receive the care and support they need." Confirming the lifting of the suspension, Ofsted said that while immediate concerns had been addressed, officials continued to monitor the school as restrictions were still in place in relation to the number of children that could be accommodated.